Final Fantasy XIV's prosperous rebirth to 'A Realm Reborn' released a year and a half ago and has been making it's presence felt in the MMORPG world. Like any successful game in it's genre, ARR allows you to create your own unique character from a variety of races including the Hyur, Miqo'te and Elezen just to name a few. Obviously the pay to play model is still not in our best interest but thankfully Square Enix finally allowed new players to test the waters with a 14 day free trial on the PC, PS4 and PS3 which we humbly took advantage of back in October of 2014. Now let's get straight to the point shall we? The character creation in FFXIV ARR happily surprised us due to several complaints from around the web about being unable to create a proper dark skinned character which is true to an extent due to lack of black African features and ethnic hairstyles BUT after messing around with the options for a good 15-20 minutes we were still able to muster up a black enough looking character. While it wasn't completely flawless (facial features and hairstyles), making the character creation diverse allowed us to be satisfied with the final result of our characters and it certainly wouldn't had been possible if Square Enix didn't bother giving their fanbase more options in the cosmetics department. Many previous MMORPGS have failed in this regard and haven't given it's players a fair choice in regards to creating whoever they wish to be. So what's the overall verdict? Well we'll give Final Fantasy XIV A Realm Reborn's character creation a solid thumbs up but allowing players to have access to a wider range of ethnic facial features and hairstyles would definitely be a HUGE step in the right direction, still at least we can say unlike some popular MMORPGs they didn't outright give a middle finger to players who want more than the generic cookie cutter clone representing them in their playthrough, which we can wholeheartedly respect. 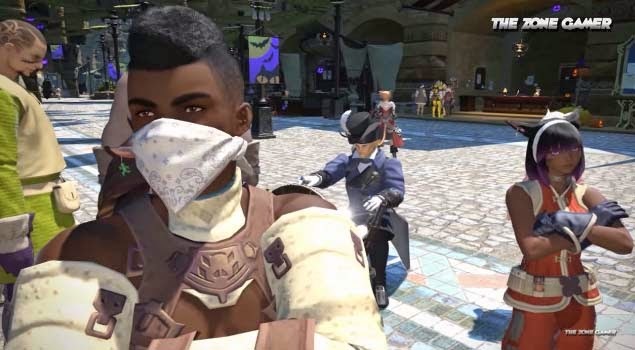 Check out our dark skin Hyur characters as we happily show them off our male and female midlanders, as they explore the vast world of Eorzea. Please keep bringing awareness to these type of topics, i enjoy reading them. Tbh i didn't even know it was possible to create a black character in this game until i saw the video and above pic. Appreciate it! I also was unaware that you could create dark skinned characters. It could be better with more hairstyles but they deserve at least one star for trying.